SKU: BSXL0. Category: 2 Dimensional Art - Signs and Paintings. 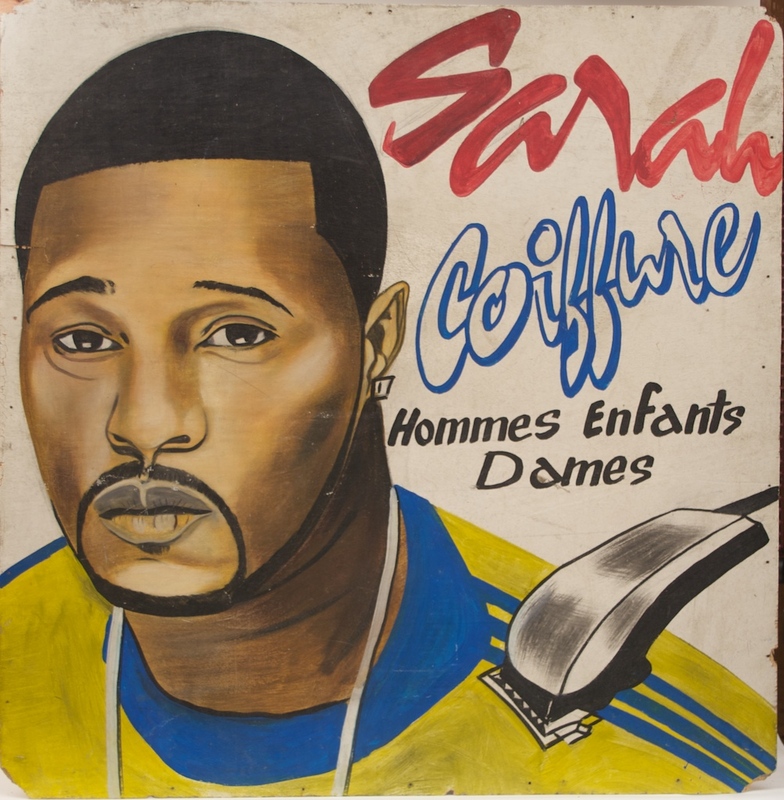 Tags: Commercial Art, painting, sign, Wood, Togo. 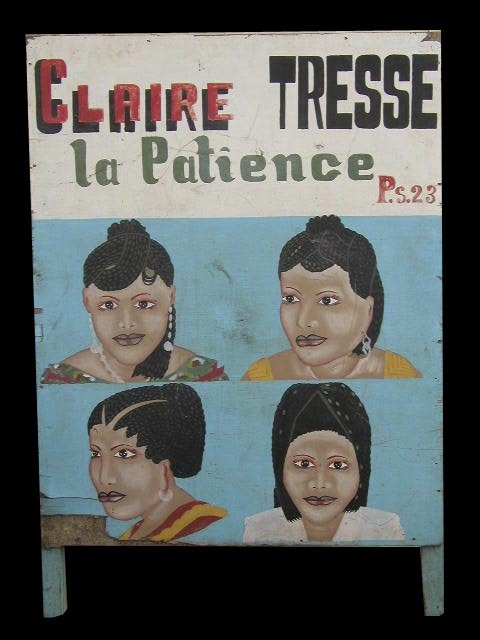 This is one side of a two-sided hand-painted sandwich sign that a beauty salon used to advertise its business in Togo. This side of the sandwich sign, which was hinged at the top, has been separated from the other side. It still has the short legs on the frame that one time supported it on the ground in front of the stylist’s shop. This sign was painted by an accomplished, though anonymous, commercial artist. This sign is painted on thin plywood so the painted veneer, as it has worn, has begun to separate from the rest of the wood, mostly on the lower left-hand corner and a small bit on the upper right hand corner. This is characteristic of signs that have been used a lot of a long period of time. 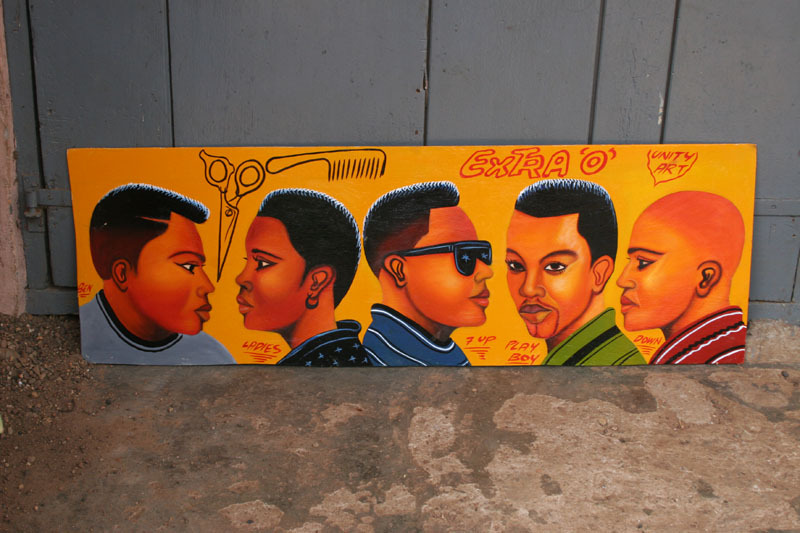 This form of African art is contemporary; these signs continue to be made although currently the trend seems to be to more professionally printed signs on paper which is now cheaper than hiring an artist. This, therefore, is one of the last of a dying art.